It’s that time again—time to add another WWE DVD to our collections! 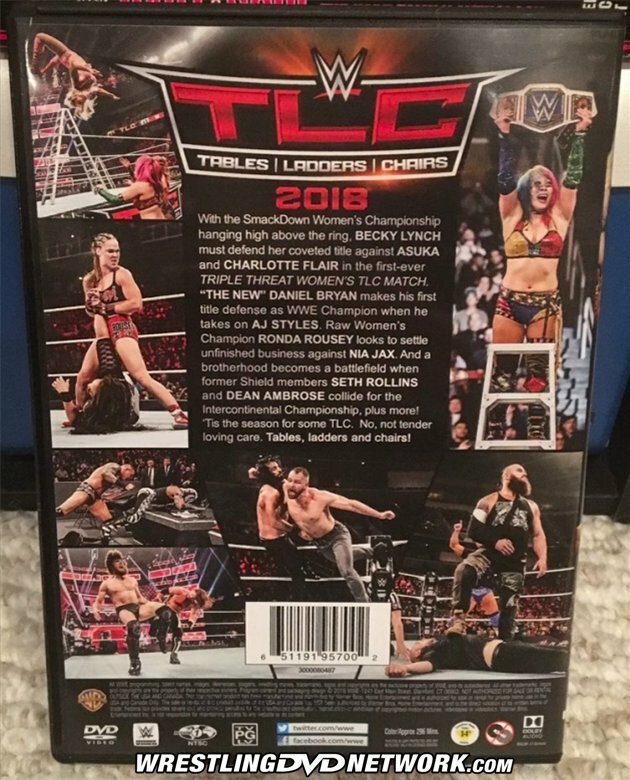 This one is a 2-disc set, WWE TLC: Tables, Ladders & Chairs 2018, and it hit stores yesterday in the United States ($14.96; Amazon.com) and is scheduled to hit the United Kingdom on February 4th (£16.45; Amazon.co.uk). Did you notice this sticker on the front cover? The Topps trading cards found inside the PPVs returned last month with Survivor Series DVD after a short time away. But not only are they back, now WWE is giving fans a chance to grab these trading cards signed by the featured Superstar. It looks like a small quantity of “Signature Cards” will be placed inside the PPV DVDs. You might get lucky and find one with your copy. If you don’t, you will still find the regular card without the signature as normal. WrestlingDVDNetwork.com can also exclusively reveal that Alexa Bliss will be featured on a trading card of her own, free inside the Elimination Chamber DVD this April. 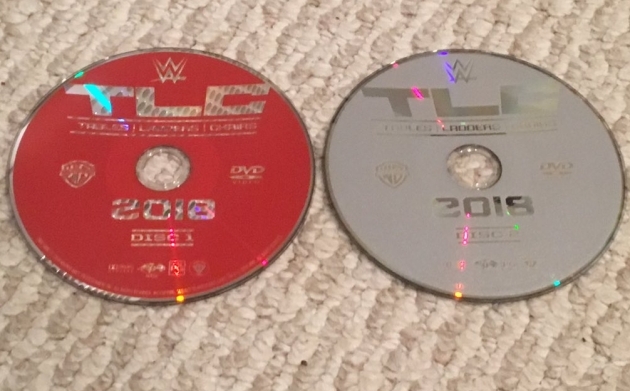 A new year of WWE Home Video releases continues with TLC: Tables, Ladders & Chairs 2018. The cover artwork of the DVD may jog your memory about the matches that night; TLC was main-evented by a Triple Threat TLC Match between Becky Lynch, Charlotte Flair and Asuka, while Daniel Bryan and AJ Styles battled once again over the WWE Championship, Dean Ambrose went after Seth Rollins’ Intercontinental Championship, and Ronda Rousey defended her RAW Women’s Championship against Nia Jax — and that’s not including 6 additional matches! The newly-released TLC DVD presents the entire 4-hour PPV event and 3 bonus features. Thanks to WDN reader Matthew Tremble we can get a look at it right now. With the SmackDown Women’s Championship hanging high above the ring, Becky Lynch must defend her coveted title against Asuka and Charlotte Flair in the first-ever Triple Threat Women’s TLC Match. “The new” Daniel Bryan makes his first title defense as WWE Champion when he takes on AJ Styles. RAW Women’s Champion Ronda Rousey looks to settle unfinished business against Nia Jax. And a brotherhood becomes a battlefield when former Shield members Seth Rollins and Dean Ambrose collide for the Intercontinental Championship, plus more! ‘Tis the season for some TLC. No, not tender loving care. Tables, ladders and chairs! The extras here include a Ladder Match and a Cruiserweight Championship Match from the Kickoff Show, along with a match between Asuka and Charlotte Flair from the SmackDown Live episode leading into TLC – full extras list. 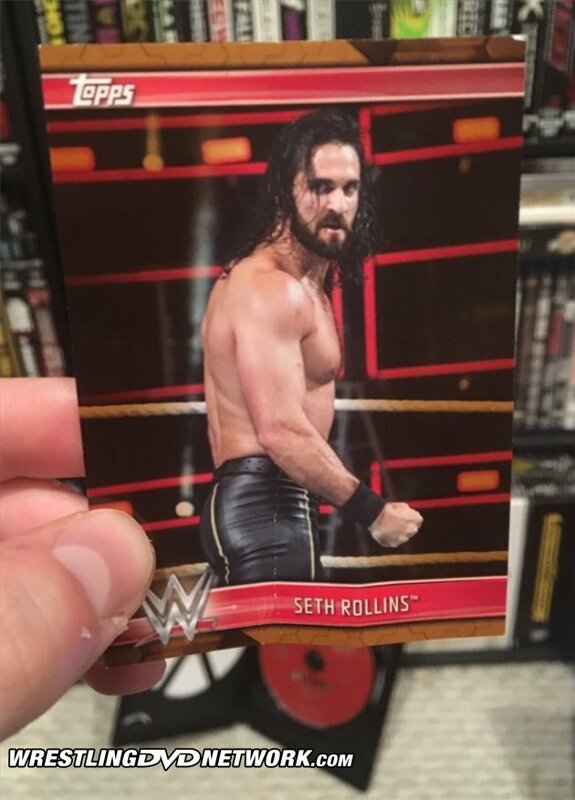 As mentioned, there’s a free trading card inside and this one features Seth Rollins! – United States: AVAILABLE NOW! 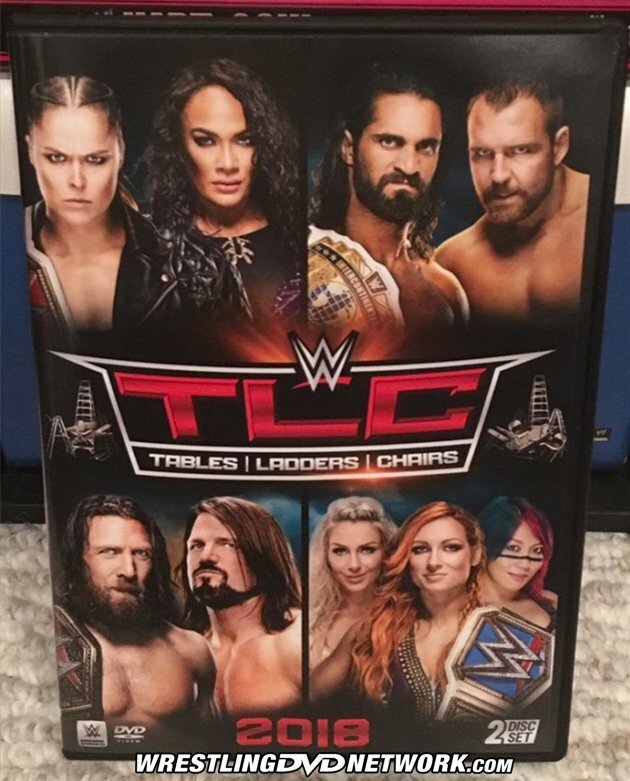 Get the TLC 2018 DVD now here on Amazon.com. – UK/Europe: February 4th. Pre-order a copy of the TLC 2018 DVD soon via Amazon.co.uk. – Australia: March 20th. Your pre-order opportunity just went live over at Madman.com.au. i think after the loss of blurays its been a downward fall i think. i mean like what dvds are they really doing? ex like ppvs which is a given and best of superstar dvds with matches and minnie interviews between matches. its sad last great bluray was Kevin Owens story bluray after that it was maina 34. So depressed at the lack of news and what’s happened to this community; it’s like a wasteland. This is by no means a knock on WDN as the guys can only report on any actual news, and there clearly is none. But as a collector it is a sad thing to see. I really hope they release more classic dvds this year even if it’s the last year they do. Didn’t Unreleased 86-95 sell really well? I wonder if the lack of DVD news is because of WWE, or if it’s a Warner Bros. thing. Ever since they started taking part in their releases, that’s when everything regressed. The lack of DVD news is worldwide, so I doubt it. I bought mine at Walmart the other day but mine didn’t come with the card, yet there was a sticker on the packaging. It’s not like you can email Warner Home Video because none of their emails seem to work. got this yesterday on dvd. over all not a bad ppv i feel like the ladder match was wasted on the preshow. seth dean was just ehh which is strange to think they would have a bad match. womans matches were really good. tag titles good real reason i got it was for styles vs bryan which HOLY HELL so good. so over all 2018 not a bad year ppv wise. i say worse were obviously crown jewel and.. parts of chamber and extreme rules. best… rumble some of maina summerslam survivor series dispite the stupid booking of it same with hell in a cell and TLC. This site is on its last legs. WWE isn’t putting out DVD’s worth a darn. No superstar sets like years past. Its only January. We know the release schedule through the beginning of April. Wwe DVDs arent done. We just need to wait for new information. We know that only PPV events are coming out through April. Nothing else. Not a good sign for the rest of the year, but also not surprising. Best of raw and smackdown and nxt discs are coming out as well. They always release those as well, so it’s hardly exciting. Just go back through the news archives and compare schedules from Jan until April from previous years and you’ll see that 2019 is the worst it’s ever been. Like Hank Williams Jr once sang, “If the sun don’t come up tomorrow, people I have had a good time.” I’ll buy dvds for as long as possible.